BRYAN EATON/Staff Photo. 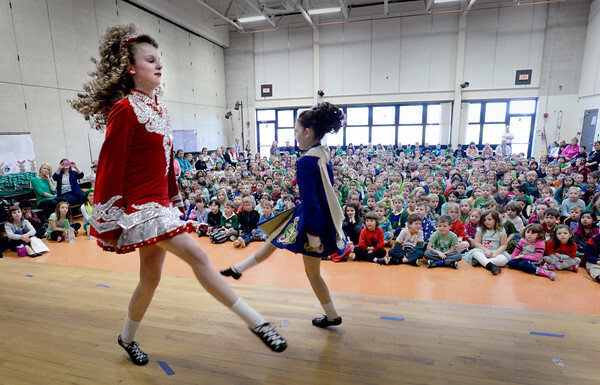 Former Cashman School students Rylee Dalton, 14, left, and Montana Currier, 12, now at Amesbury Middle School, perform Irish stepdancing along with present Cashman student, Charlotte Costigan, 8, not pictured at a St. Patrick's Day assembly on Friday at the Amesbury school. After the performance students played different games at the sShamrock Toss, Hat Stack and Leprechaun's Gold.